We finished a whole room in the new house. As in, everything has an away place and we have actually put things up on the walls. It feels pretty good. Not surprisingly, we decided to fully finish Will's room first. We wanted him to be settled in first and so last weekend when he and Nate were off at a family reunion, I made a big push to finish his room. 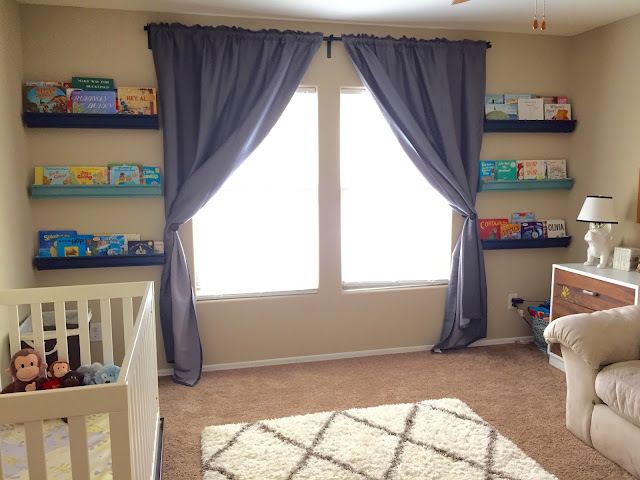 Today I'm going to share how I added a ton of book storage to his room. My biggest complaint about this new house is the lack of useful storage. My second biggest complaint is that the entire house is painted this beige color and I'm not a fan. But, until we officially close I'm not painting and so I'm trying to be ok with the color and bring in some brighter colors in other ways. This brings us to the colorful bookshelves. They are made of gutters and are super easy to put together... but first a little backstory. This is where the room started. 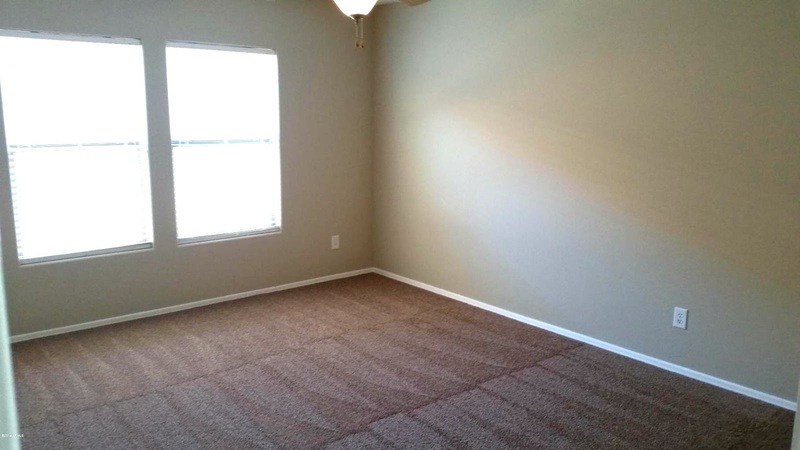 Lots of beige, skinny baseboards and no window casing. The number one thing we did (before the rest of our stuff arrived) was to get black out curtains for the windows. Since AZ doesn't do the whole daylight savings thing, the sun comes up at 5:30 am right now and no one wants a 2 year old up that early. 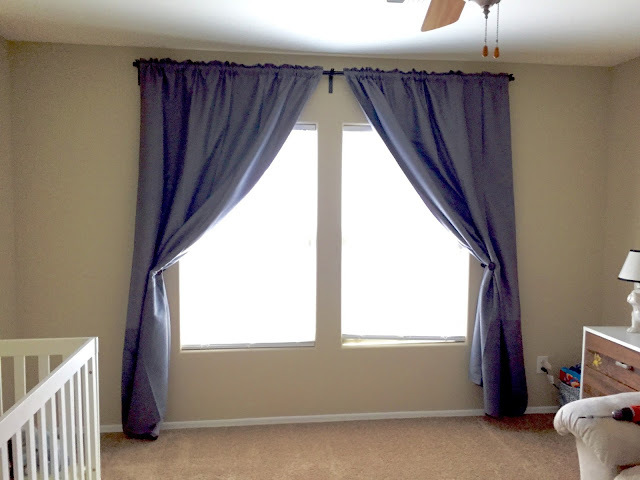 I got these curtains and the rod at Ikea for under $60 for everything and then I picked up a couple of tie backs in the clearance section of Lowe's. The only challenging part of install was that we didn't really have anything to stand on yet and so I pseudo balanced on our new Ikea chairs to screw everything in (with a regular screw driver... no drill). It was worth it though... these curtains make Will's room almost completely dark. Next up was doing something with all the wall space. We put Will's bookshelf in the playroom so I really wanted a way to display all of his books and allow him access to some, but not all, of them. Our friend Desi mentioned the idea of gutter bookshelves and it seemed perfect for either side of the window. If you haven't see gutter bookshelves all over Pinterest, don't worry, I hadn't either until recently.... but apparently it's a thing. So this isn't a novel idea by far, but since I put these together before seeing the copious amount of examples on Pinterest, I thought I would share what I did since I did a few things really differently. I started in the gutter isle in Lowe's. I initially wanted to do metal gutters but between the fact that this Lowe's was very poorly stocked on metal gutters and I was a little worried about the potential sharpness of the metal ones, I moved to a PVC option. The gutters themselves are cheaper than the metal ones (at just under $4 for 10' vs ~$10) but the end caps are much pricier (~$2.50/side vs $0.70/side). If you aren't doing many shelves then this isn't really an issue but I wanted to do 6 shelves so those end pieces added up quickly. You don't need the end caps but they provide a ton of stability so if you are putting things like books in them, it's a good idea. I ended up getting two 10' long gutters and a total 14 end caps (I made 6 shorter and 1 longer shelves). I brought everything home and used our new toy (a major upgrade since our old chop saw bit the bucket right before we moved) to cut the first gutter into 4 30" long section and the second into 2 30" and 1 60" section. 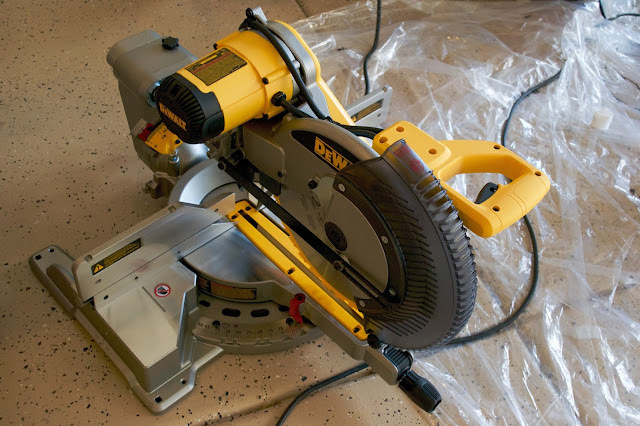 I'm not a fan of cutting PVC but since this new chop saw is on rails, it made it super easy to cut the gutter all the way through with just one cut instead of two. Most everyone seems to keep their gutter shelves white but I wasn't going to add more neutral to an already boring room so I brought the cut pieces and the end caps out back to spray paint them. I picked two colors, a dark blue and a teal which just happened to match our umbrella. 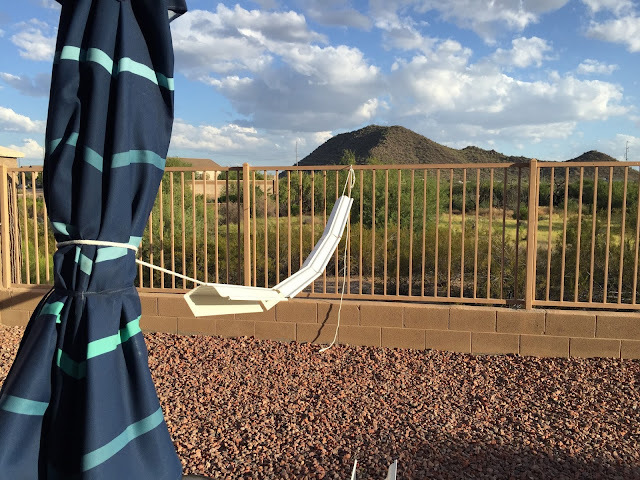 I strung up a rope between the umbrella and our back fence and hung each gutter piece off of it. We've used this method a few times now for spray painting and it works really well. 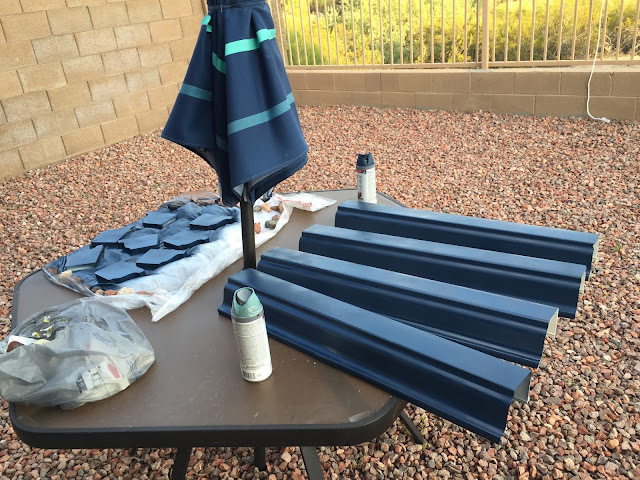 I only sprayed the sides of the gutter that would show (aka not the back) and even doing that we needed to go get a second can of the dark blue (the color we did 4 shelves with). I initially painted the end caps flat on plastic and then once I assembled everything I sprayed the edges. The end caps literally just pop right on so once I did the finally spray I just let everything dry overnight and they were ready to hang. I ended up using drywall screws to attach these to the wall. Each shelf got 5 screws which may seem like overkill but I wanted two to go into studs, two to go through the top corners so that the end caps were also secured to the wall (which adds a TON of stability) and then one to go near the base of the shelf so that it didn't wobble. 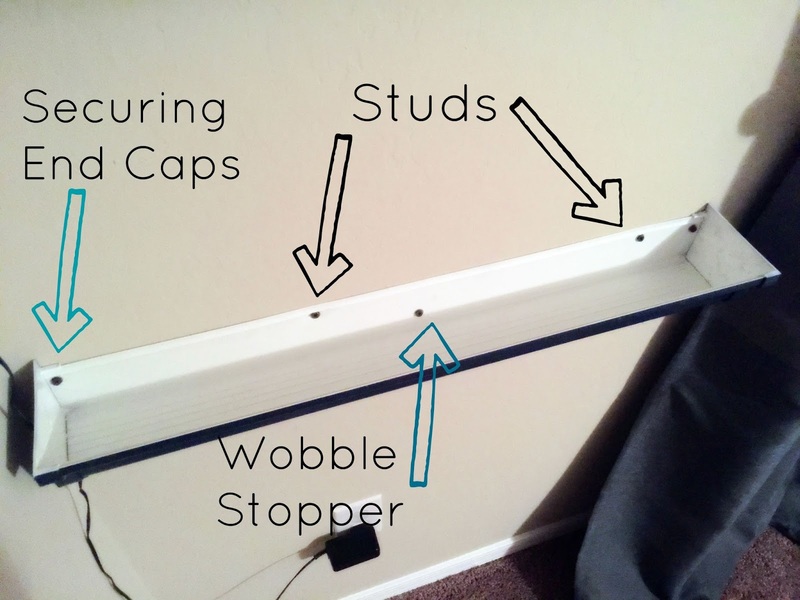 I predrilled holes for the three that weren't going into studs, attached the shelf to the wall and then used our stud finder to find where I needed to put the final two screws. Once I had one side up, the hardest thing was making sure that they shelves on the other side of the window were level with the first side. This we a little tricky and I ended up having to redo them three times before I got it right. The mistake I kept making was that the back of the shelf is a little lower than the front, which is slightly different than the top of the end cap. So if you are trying to do the same, measure to the top of the end cap... it's a lot easier than the other two. I love how these came out. They are super sturdy and hold a ton of books. We were a little worried that they would bend under the weight of the books but they are very solid and only bend if you pull hard on the middle of the front. Even then, it won't damage the shelf at all. Will can reach the books on the bottom shelve and so we put his board books on those. 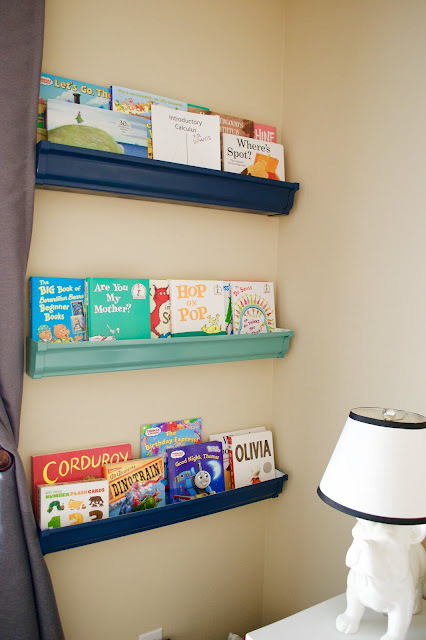 All the ripable books are on the higher shelves so that he has to ask to read one. He seems to love the independence of being able to get (and put away) his books and will point and ask for higher ones. Being able to see all the covers has been a real success in increasing his reading interest. Overall, these shelves are both a design and utility win and all in I spent just under $50 for all the shelves (including the long one). 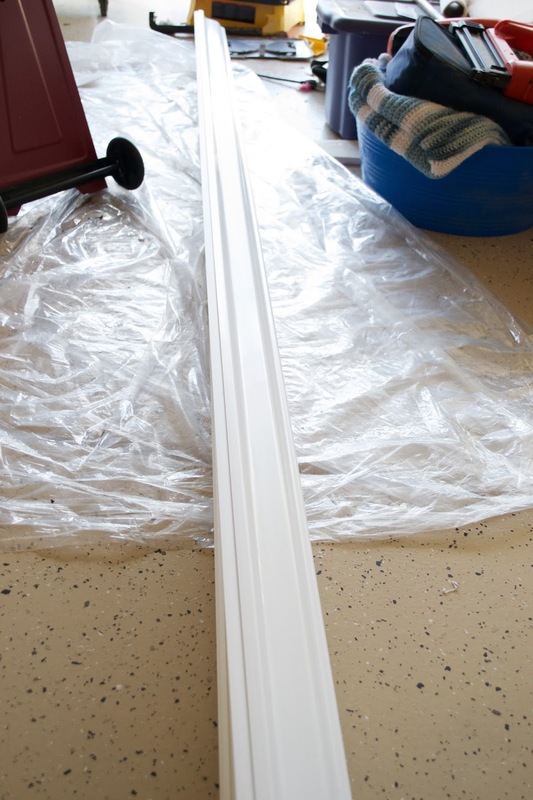 I'll share the rest of the projects and his full room (including where the long shelf went) as the week goes on but first.. have you tried the gutter shelves? I'd love to see pictures of how yours turned out!